Im taking a break from life and its worries and dig into Christian Kjellvander. 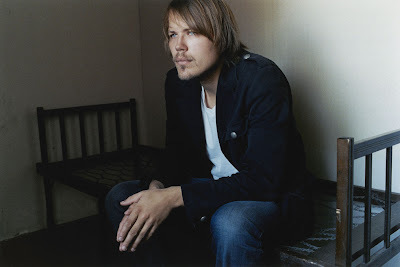 He is like balsam för själen [conditioner for the soul] with his soft Americana-inspired songs. He opened my eyes when i saw him live for the first time, sometime after he released his first solo album Songs From a Two-Room Chapel in 2002. In interviews its often mentioned that Christan grew up in the US and moved back as a teenager, which also gives him the special American sound [and a great accent]. Wherever it comes from, its good, sometimes its even brilliant. When i saw him at a festival this summer it struck me that he has always been a high-quality artist, both live and on his albums. On the latest album I Saw Her From Here/I Saw Here From Her his wife contributes with vocals, which i think gives it a new dimension. Another great match with a female voice is the duet Roaring 40's with Cardigans Nina Persson. Except for the four solo albums, Christan has also been making music with the band Loosegoats and his brother Gustaf in Songs of Soil. Make sure to check them all out, im pretty sure you will enjoy it. Check out Christians website, and make sure that you read this interview with him [use Google translate] its a nice one.